How should you respond to "Give me a fish" / RTFM questions? I mean the case where people post questions simply to get someone else to write their code for them, on topics that would usually be the first result on Google if they had taken the effort to search once before posting. Usually I just plug in a link that points them to the right place... and the Google search terms I used if I'm annoyed (aka I do their Google search for them). This is the "teach them to fish" approach. But given the big and growing SE user-base, these questions usually elicit someone to post an actual code sample — the "give them a fish" approach. I'm wondering what the community thinks about this. I'm thinking we're making lazy people even lazier with the latter approach. The person just scrapes the code off the response and into his source and off he goes without being any smarter. The person is going to repeat the same behavior the next time he is stuck. Although I'm fine with people choosing to maintain their intellectual status-quo, is SE encouraging the wrong behavior? I believe the appropriate action should depend on the question. If the poster is simply asking for someone to write their code for them without putting in any effort themselves, I would downvote and vote to close. If these people really don't know a better way to get their questions answered, then it's up to us to teach them, not to answer the questions for them. Otherwise, they may literally never learn. I have no reason to believe this is a matter of stupidity. I honestly don't know why some of these people are doing this kind of work. I've tried to find out, but have not yet found a way to ask the question in a way that gets me an answer. In some small number of cases, on the ASP.NET "XML Web Services" forum, I have been left with the impression that there are people who are working for a bad outsourcing firm (I've worked with several good ones). I get this impression when someone basically says, "I just started today, and my boss told me to write a web service that does so and such. What is a web service?" or when they come up with some nonsensical requirement that was clearly not understood, yet seem terrified of asking the customer for clarification. Those (small) number of cases are absolutely not helped by handing them the answer. They will never learn how you got the answer, for instance. It has amazed me to see the number of people who are not familiar with http://msdn.microsoft.com/, and who have found it only because I posted links, including the search links. They'll also never learn how to find the answer themselves next time, except that you will have taught them that the way to get their job done is to not stop to think, not spend five minutes on a Google or SO search, but to just go ask on SO and get some "helpful" person to do the job for them. "Please don't feed the pigeons" is not the same as "please be mean to pigeons". It's purely practical. It's not the individual "give me the answer" question that's a problem. It's the history of asking the same bad questions over and over that is a problem -- is the user actually learning, or abusing the system? Whatever else you do; don't just add a "lmgtfy" - it is likely to be both downvoted and deleted. I'm with Paolo here. I discourage "RTFM" within responses. I actually ran into a guy yesterday who used that as part of his response and down-voted until he changed it. He later got an up-vote from me. The question was on the DELETE command in SQL, so it really only needed a link to the docs. At times, I'll just post this link - I mean, the person asking the question may be totally fresh to this world, and not even know what a doc is, let alone how to use one - I didn't at one time. Another user asked "how to translate this code to regular PHP" yesterday. It was a small block, showing an object method being used, but was entirely procedural. I took it anyway, and tried to explain some of the more confusing things, like the ternary operator, and a formatting print statement. In this world, I don't tend to get upset over "stupid" questions. I just help. Most institutions that set homework have a policy that submitting answers you can't explain or copying without attribution is grounds for failing the course: either way you'll be no better placed when exams come round. Just copying code or answers to plug in to, for example, Project Euler, seems only to short-change the person who does it. We might view it differently if someone takes a code snippet we wrote, uses it in a project that gets into litigation over patents or copyright or fails in other ways where lawyers get involved. Let me prefix my answer with this statement, I love to teach. I've always enjoyed it and I like, where possible, to mentor rather than just teach rote. That said, I have little time for someone who hasn't tried to learn themselves. Even a "I tried searching Google but wasn't able to find anything relevant" would be better than a clear statement that they've done nothing more than find SO and post their question. Let's be clear here, they had enough intelligence to find SO, I'll just leave that out there hanging. There is no such thing as a stupid question, I heartily support that statement. There is, however, such a thing as a lazy question, often mislabelled as a stupid question. I fully support that newbies are going to ask questions with, for the experienced, very simple answers and where the answer incorporates guiding the OP to a more correct path or helping them dig into the internals of difficult problem then that's an answer worth posting. If it's just pointing them to documentation (anyone who doesn't know what documentation is (I saw someone comment about this) shouldn't be trying to write computer programs in my opinion) then that's a waste of their time and ours, they should be directed to find that information themselves. They'll never gain the skills needed to get Google to present what they are looking for rather than what it thinks they are looking for if they are always presented the answer on a plate. Do we really want to turn SO into a manual search engine? I thought the intention here was to build a repository of quality information relating to software engineering/development/programming issues that was searchable (locally and from Google) rather than simply replicate what's already out there, however facile. Let's be clear, the supposedly rude responses are primarily symptoms of lazy questioning which is a bad habit. Why are so many people intent on removing the symptoms while the cause is effectively supported through that action. Waking quite an old question here, but it seems everybody's answers focus only on askers of trivial question, while I believe the answerers of trivial questions are the bigger problem. Sure, askers might be beginners, but what I see are obvious questions with one or zero constructive answers (e.g. abstract explanation with pointers to authoritative references) and 5-6 different non-wrong ready-to-copy answers, all of them upvoted. Other beginners will come to SO, search for their issue, and get their answer on a platter. They will not learn anything from this process, besides "SO has ready-to-use answers". These answers will not help them stop being beginners. This also discourages people from posting more constructive answers. When you see a bunch of fishes given to the asker and already upvoted, a constructive answer is very likely to not get accepted, and I've seen comments along the lines of "why is the RTFM answer upvoted". In a recent example, such a lacking answer resulted in another question due to not understanding the previous one. Probably there should also be voting for non-constructive answers? If you're just going to give them a relevant link and the search terms you used, that's fine for a comment. You can make it a full answer by also quoting the relevant information from the manual, or including an example that illustrates how it answers the question (or both). After listening to some of the podcasts, the view expressed by Joel seems to be he wants the answer posted even for the simplest of questions (see how-do-i-move-the-turtle-in-logo). I don't remember which podcast it was in. My interpretation was that Joel wanted good factual answers in SO. Not a google search link, or an answer that said RTFM. To answer your question, I usually respond with a downvote and a "What have you tried comment." Overall, I see this as a fundamental flaw in the SO gaming mechanics. The mechanics encourage people to post answers to questions to get upvotes. Simple questions are the "low hanging fruit" that people can use to get a few easy upvotes on an answer. So when you see these questions, you will see a few "What have your tried" or google link comments and then a barrage of answers that provide all of the code needed from people hoping to get a few precious upvotes. So then the question becomes, what do you do with the answers to these simple questions? Most people simply do not upvote, but some do, acting as an enabler for this behavior. Downvoting them doesn't seem fair, as the users are providing a valid answer to the question posed, but the question provides little value to the site. Closing the question prevents additional answers from being added, but the answers that got in before the closure are still there and people still benefit from the upvotes they had received. I try to do both: I show them a link, and give them a code sample (maybe not exactly what they need so they can finish it up), with a (hopefully) decent explanation of how the code works so they are aware. Giving a link is OK, but be careful if you give a link to a google query. If the question becomes popular enough, or the answers good enough, it might end up pointing back to itself. Bounty used to encourage people to write code for you - is this ok? “Do my work for me” type of questions - how to react? What is the disincentive for failure to RTFM / embrace GIYF? 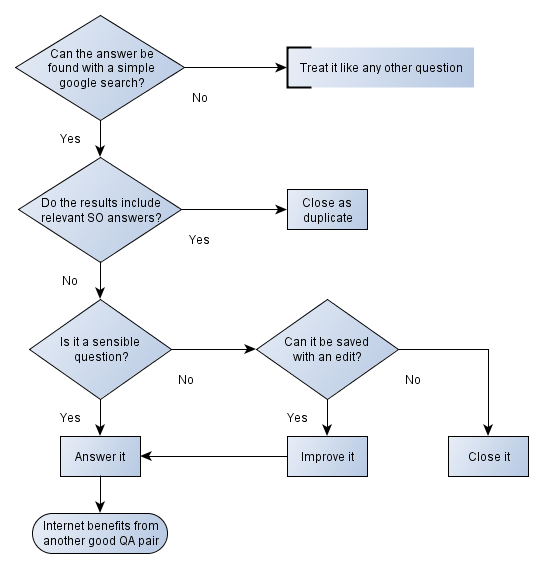 Is it unreasonable to ask too many questions on Stack Overflow?